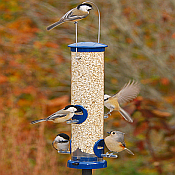 Our large selection of quality crafted tubular bird feeders come in three types depending on which seed you use, tubular seed feeders, tubular nyjer (thistle seed) feeders, and tubular peanut feeders. Some of the tubular feeders we offer even allow you to feed more than one type of seed at the same time. 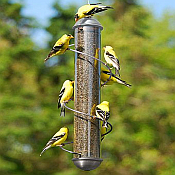 Tubular bird feeders come many different sizes, colors and some offer features making them resistant to squirrels or squirrel -proof. They can be pole mounted or hung. 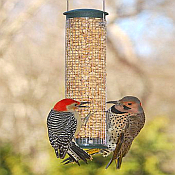 We offer tubular bird feeders from Aspects, Droll Yankees, Woodlink, Brome Bird Care, Bird Quest and others. Most are made in the USA and carry lifetime guarantees against squirrel damage.